Kevin McCormick (www.kevin-mccormick.com) is a classical guitarist, composer, and teacher based in Texas who has released several albums over the past twenty years. 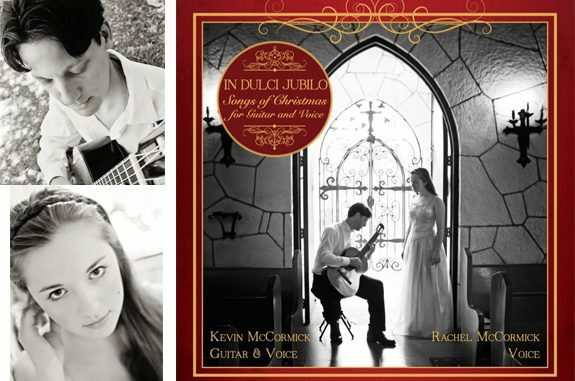 His new album, In Dulci Jubilo: Songs of Christmas for Guitar and Voice, featuring the vocals of his teenage daughter, Rachel, released today, on the Feast of St. Cecilia. It is a collection of fourteen songs for Advent and Christmas, including “In Dulci Jubilo”, “Ave Maria”, and “Panis Angelicus”. He recently responded to some questions I sent to him about the new album. CWR: For those who aren’t familiar with your work, what is your musical background: where did you study, what have you recorded, and what do you do as a full-time musician? What about your daughter, Rachel? McCormick: My mother was a music teacher and choral director and so music was a large piece of the fabric of our family. My older brother played piano and my younger brother played drums. I’ve played guitar for nearly as far back as I can remember. I started when I was seven and studied privately for many years. And yes, I’m not ashamed to say we were a band. We spent most of our time writing our own music. By high school though we were playing cover tunes at clubs and other gigs and generally enjoying it all. I continued with a band at Notre Dame, but while there I also rediscovered classical guitar and classical music in general. During a year abroad in Rome I studied at a guitar conservatory with a student of Andres Segovia. I realized how much I loved the sound and repertoire of the instrument and so I pursued it on and off for the next decade. A stint in Japan allowed more of the rock thing and club playing but also the study of Japanese music. Along the way I began to take composition more seriously. When my wife and I returned to the States I studied guitar and composition at Indiana University’s School of Music. Eventually we wound up in central Texas where I was trading time between writing serious post-rock song cycles, writing for my own ensemble in Austin (which once again included my brother on drums), and composing classically. The song cycles became my first two recordings [With The Coming of Evening and Squall]. In fact, they are part of a tryptic that awaits completion. Stylistically they spring from many styles including jazz, east asian, film music. I was heavily influenced by the work of Mark Hollis during that time with my own foundation as a classical player was woven in as well. But you never know what God has in store. I ended up establishing a teaching studio in our small Texas town and playing classical gigs in the area. That lead to my three solo guitar recordings: Solo Guitar (an introduction to classical guitar), Americas (music of Latin America and some original compositions), and Songs of the Martin (collection of songs performed on a 1846 Martin Guitar). My daughter Rachel definitely inherited a love for music. She has been singing ever since she could make sound. She has cantored at church since she was ten and has sung in stage musicals at our local theater. She has sung with our church choir and her school choir for nearly ten years. She has done some private study, but really she just seems to have been blessed with the voice and the spirit for singing. Some of my fondest memories of her singing have nothing to do with a stage. She sings all the time. CWR: Why did you decide to produce a Christmas album? What do you hope people will hear and experience when listening to the album? McCormick: Every year around this time I would get asked to do a Christmas recording and I would always hesitate because I have no desire to make a recording just for the sake of it. There are many amazing performances already out there (in addition to all the fodder) that I was simply not interested in adding to it without a real sense of purpose. Some of our local banks put on community performances around Christmas time and Rachel began coming along when I played for them—at first just to watch and then to sing a song or two. By the time she was thirteen we had a whole set we were doing. Hearing Rachel’s voice maturing so beautifully, especially when cantoring, I realized that we had a unique opportunity to collaborate on something beautiful as father and daughter but also as two artists with similar sensibilities. One of the things I learned from making music with my brothers was that the best collaborative art includes an unspoken communication. Great jazz works that way, but even non-improvisatory music has real communication among the players. We hope you can hear the arrangements as telling the story in a dramatic but beautiful way. Hearing traditional pieces with a new ear and new pieces in a familiar sound. CWR: How did you go about deciding which songs to include? Did Rachel have a say in the songs? What are some personal favorites? McCormick: The songs really grew out of the set list that we had been performing for a few years. Rachel is very much her dad in certain respects so she always has an opinion about whatever we’re doing. But she has been blessed with a great musical sense. When she was confident about a new idea or about making an adjustment to the arrangement I could trust that she would take us in a good direction. We did make concessions to one another here and there but for the most part we were in agreement. I was delightfully surprised at how well we worked together in a creative setting. I think the best example is “What Child Is This?” I had worked up the accompaniment as a combination of several different versions I had played over the years. Once we fit it to a key that was good for her voice she suggested a more dramatic approach: beginning as a quiet lullaby, building the energy into the story, and sort of freeze-framing the final section. It takes a carol that uses older, unfamiliar poetic language renders it more powerful and meaningful to the modern listener. I think it really brings the song alive. She also suggested the key change at the end of opening and title track, “In Dulci Jubilo,” and that just makes the song for me. Suddenly we’re in a new musical space with a brighter energy. Generally I’m not a fan of key-changes just for the sake of it, but for whatever reason it really seems to work for me in that setting. I have to admit a fondness for classics like the Bach/Gounod “Ave Maria.” One of our goals with the recording was to try and capture the sound of Rachel’s voice in the middle space between childhood and adulthood. As much as I can appreciate the skill of operatic soprano work, I really much prefer the pure sound of a less driven and less powerful voice—one that embodies the spirit of the prayer. It is one thing to sing Bach; it is quite another to pray through Bach’s music. I still consider the Rutter recording of Faure’s “Pie Jesu” as my standard for how prayer should be sung by a soprano. CWR: The album has a very intimate, “up close” feel to it. Did you record it “live” together? McCormick: As a classical guitarist, I’m all about the intimate and up close! I’m so glad you asked that question because the intimacy was precisely the goal in my imagining the production. I specifically chose the studio we used because it was a part of a large performance hall. I knew that we would be able to hear and feel that space even though we were close-mic-ing for most of it. It’s really not so much that you hear the room in the recording but that as a musician you feel your instrument working in that larger space. Phrasing and touch are quite different in that setting that in a six-by-six, carpeted room and it really affects how you play. We used the classic Neumann mic for vocals and guitar whenever we could. We began recording live together, but found that neither of us was in the position to really do that for the whole thing. Classical guitar is extremely difficult to play cleanly in a recording setting. Every squeak is amplified a million times. And this being Rachel’s first recording, she wasn’t aware of how difficult it would be to sing every note exactly as she might like it. Of course, perfect isn’t really possible even for established professionals but we set the bar fairly as high as we were capable of doing. So in the end we were able to keep a few of the duets that we tracked simultaneously, but for the rest we multi-tracked. She would sing a scratch vocal in the booth and while I recorded in the big room and then she would take the room to put down the final vocal. Perhaps someday we will both have the time and money to put in the preparation and recording time needed to record it all live. That’s honestly my dream recording session—like Miles Davis’ “Kind of Blue”—just sit down, hit record and play it. But of course we left lots of “mistakes” on the recording, as I always have. We went with the takes that had the right feel and energy, multi-tracked what we could and left the rest. At one point I actually made sure we didn’t fix something because it just felt more human as it was. Ultimately that was our goal. To make a very intimate recording music of celebrating joy and anticipation of the Annunciation through the glory of the birth of the Christ child. Hopefully we came close. Tragedy has struck America. 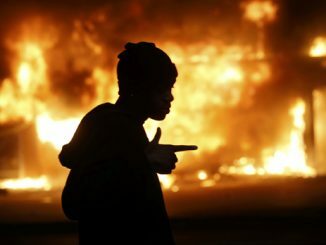 But a Grand Jury did its job.